The importance of reflective tape on trucks cannot be understated. Trucks are work vehicles and must be in operating condition in order to be used in maintaining a revenue stream for a company. The use of reflective tape on your truck or trucks will only increase their visibility to others on the road which in most instances prevents collisions and the loss of use of your truck for any period of time. To help an organization or company equip their work trucks with reflective material it is now available in roles and is adhesive for easy installation. This makes it easy for the reflective material to be applied in the areas it will be most visible at day or night for other vehicle drivers to see. What surprises most observers is that this type of reflective tape can easily be seen in the daytime. They are so reflective that any light source, even the sun with daylight make them more visible to others. The official name and category of this type of reflective tape is Reflexite V92 Daybright DOT-C2 conspicuity material. 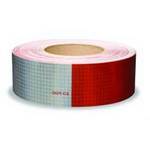 This specific type of tape can be purchased in either white or red. It also com es in rolls and is adhesive in both white and red if it is preferred. The material of the reflective tape is solvent and weather resistant. The tapes film is made to resist cracking for long periods of time after being applied to a surface and the adhesive used prevents it from becoming unbounded from the surface unless it is removed with a razor blade type of device. This makes it possible for it to last for a long period of time on your work trucks in any type of working or road conditions and still maintain a high level of reflectivity to help keep your vehicles and drivers safe from collisions while on the road or even when they are parked. A few of the physical characteristics of this specific type of tape includes it is visible over a long distance with a rating of 600 cpl. It exceeds the DOT-C2 qualifications for FHWA and exceeds the minimum requirement by 2½ times. This tape continues to work even after it has been involved in an impact with other vehicles or other devices. The material the tape is constructed of is a metalized polymer and has an adhesive strength of 96 oz. The performance temperature is up to 175C when it will start to lose its reflective quality. There are other types of reflective tape made for helmets and cyclist along with agricultural vehicles. This is the Reflexite V82 DOT-C2 conspicuity material. It is compliant with ANSI/ASAE S276.7, ANSI/ASAE S279.15 and ASTM D4956 type V specifications. The use of reflective tape is to increase the visibility of your vehicle to others in a way so the safety of the material on the vehicles along with its passengers can go to a higher level. The reflective tape will also help to prevent unwanted accidents like collisions from occurring.